Life of a mad typer: New Nail polish subscription box? YES please! New Nail polish subscription box? YES please! Q: Who came up with the idea for this box? Was it something that was done for fun or was there a need in the community that the founder saw and wanted to fulfill? Q: Will the brands change out or will it always be Philly Loves Lacquer, Smokey Mountain Lacquers, Digital Nails, and Northern Star Polish? A: Right now, these four brands will be permanent. Depending on how well the box is received, I may look to add, rotate, or feature in the future, however, I see a lot of rotation in the sub boxes offered these days, and I thought it would be nice to have consistency. Q: The description is a little ambiguous. Is it a monthly subscription of 4 themed lacquers and then every month (every 2 months) you get 4 themed + 4 more (for a total of 8)? Or is it a bi-monthly subscription of 9 lacquers sent every other month (4 themes + 4 more). A: I had a hard time coming up with a description originally, since bi-monthly could mean either twice a month or every two months. So, that being said, this is 4 bottles of polish (one from each brand), plus 4 extras (one from each brand), shipped every two months. The extras will be anything from matching accessories, handmade personal care products (cuticle oil, lotions, lip balms, etc), nail art tools, candles, etc. The timeline of the box right now is October/Halloween, December/Holidays, February/Valentine's Day, and so on. Q: Why every two months? Why not have it be monthly? A: I feel like the monthly box is the norm for indie subscription boxes. When you're working with a product like indie nail polish, there are a lot of factors to think about. I decided to make it every two months because I wanted to make sure that the four of us were putting out the best products possible, and with that came making sure we all had enough time to put out said product. You have to factor in a lot of things when doing something like this. You have to account for blogger coverage (and the time it takes on their end, because their time is just as valuable, if not more, than ours), testing and lead time, and life happening in general. A lot of things can happen in 4 weeks that could jeopardize the box, but by having it every two months instead, we're making it easier on ourselves the makers, and also easier on the wallets of our customers. Q: Are the 4 polishes exclusive to The Beauty Quartet or are they polishes already in the core lines of the brands? A: the 4 polishes will be exclusive to the box, and will not be available for sale outside of the box. Since it will be purchased by pre-order, we will have an exact amount made, and any extras will only be for replacements if the polish is damaged in transit. Q: How will people pre-order in September? Will there be a supplementary website? 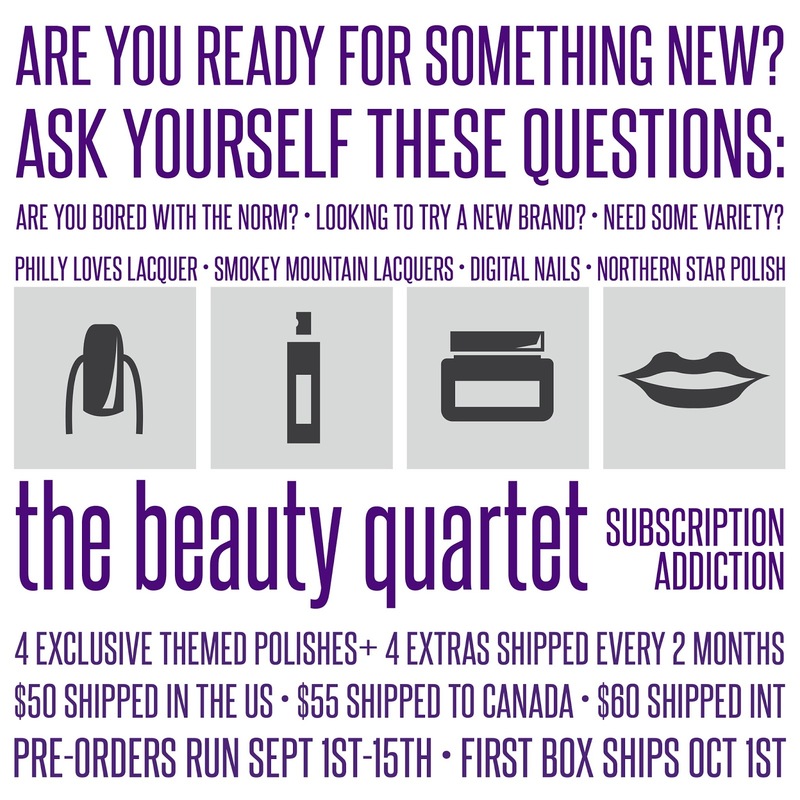 A: The BQB will be available for pre-order on the Philly Loves Lacquer website. Q: Will this subscription service run through Paypal with automatic payments (like A Box, Indied) or will it be pay at checkout only? If the latter, will people who have subscribed to the last box get a priority to order the next box before new people? A: The "subscription" will be pay at checkout. This allows people to buy it only if they want to, and not be locked in for a certain amount of time. The pre-order runs for 15 days, which allows everyone a chance to purchase the box. There will not be priority for those who ordered previously, as it is first come first serve. Q: Will photos of the polishes/boxes be available during the pre-order or for people to look at? A: Absolutely! This is *NOT* a mystery box by any means. We have hand selected several bloggers to receive a full box to swatch and review, and there will be plenty of coverage before the pre-order begins to allow everyone to see what will be available and to determine whether they would like to purchase the box or not. We'll be plastering photos all over our Facebook pages, Instagram accounts, and in nail polish groups on Facebook and Reddit. Q: Will individual polishes be available for sale at any point through Beauty Quartet or through the individual brands? A: I am not 100% clear on the question...but I know that each of our respective shops will maintain normal operation. As I mentioned before, however, the polishes in the BQB will only be available in the box and not for individual purchase. Q: Will boxes be available at the same time each month or will people need to watch X site for updates? A: The BQB timeline will always be as follows: pre-order begins on the 1st and runs to the 15th, and the box will ship on the 1st of the next month, so for the first box, pre-order runs Sept 1-15, and it ships on Oct 1st. For the second box, pre-order will run Nov 1-15, and will ship on Dec 1st. For the 3rd box, pre-order will run Jan 1st-15th, and will ship Feb 1st. The BQB will always be sold in the Philly Loves Lacquer shop, and you'll always find updates on all of our brand's Facebook pages and other social media. Q: I know it says international shipping is available; are there any countries that are excluded? A: As of right now, no. This may be reevaluated as time goes on, as I know there are a couple countries where it could take more than a month to arrive. I have not personally sent to any of these particular countries before, but there's a first for everything. Q: Will tracking information be available for the USA boxes? How about international? A: US orders will be shipped via USPS Priority Flat Rate, with tracking, and will come with insurance of $100. International orders will be shipped via USPS First Class International. The following countries will have tracking available to them: Australia, Belgium, Canada, Croatia, Estonia, Finland, Germany, Great Britain & Northern Ireland, Hungary, Israel, Latvia, Lithuania, Malaysia, Malta, Netherlands, New Zealand, Singapore, Spain, and Switzerland. International customers will also have the option of adding insurance for a nominal fee, or upgrading to Priority International (cost will depend on country). Q: How will you handle customs for international orders? 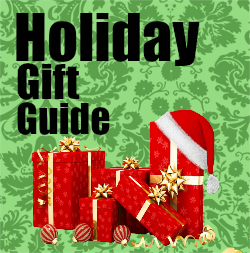 A: International orders will be declared as gifts, with a value of $45 per box. We will not be responsible for customs tax, duties, or other fees, nor will we be responsible if your package is confiscated.